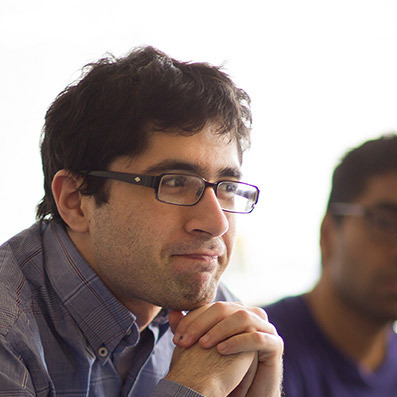 We are doctors and medical students building software to improve delivery of care. We believe in software that enhances the physician-patient relationship. We believe that improving access to information at the point of care improves quality of care and patient outcomes. We believe that we can build software that physicians, nurses, and care providers love to use every day. Hyper-local knowledge sharing for clinicians. The CareTeam App is a phone-friendly web application that gives clinicians instant access at the bedside to contacts, guidelines, and protocols customized for their practice environment. Every outpatient setting has different resources for patients requiring specialty care. 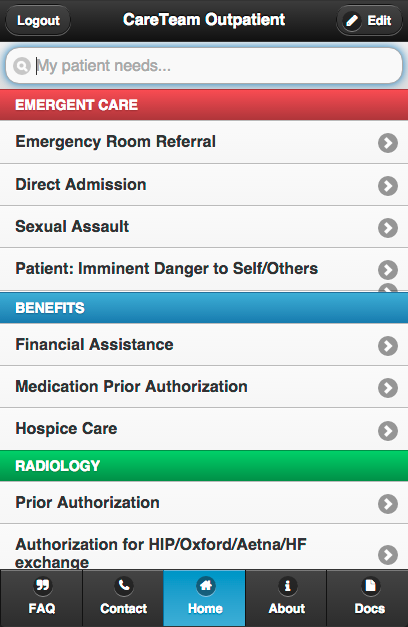 CareTeam can organize your institution-specific referral protocols for rapid access. Stop fumbling for the right sequence of communications needed to complete a handoff. 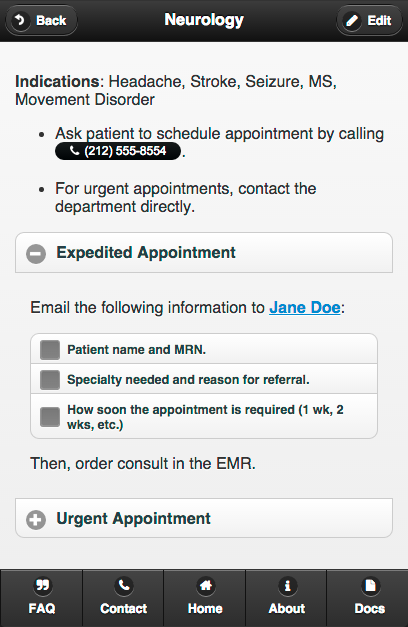 Embedded checklists, phone numbers, and templated emails save clinicans time, every day. Not sure who just paged you? What's the unit pharmacy's extension again? Save your brain! Just search your local contacts in CareTeam. 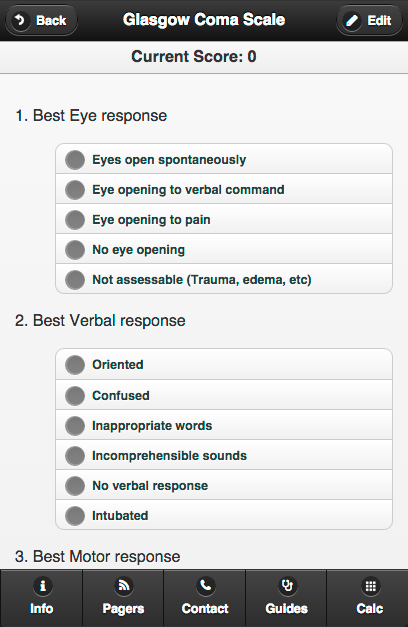 Your clinical team has its own unique blend of preferred protocols and society guidelines. 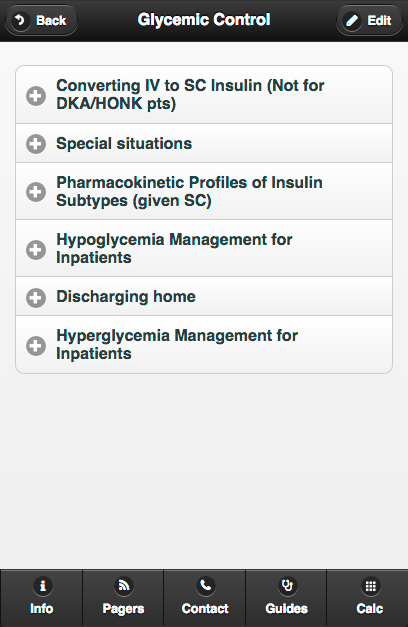 We convert them into beautiful, quickly accessible guides for lookup at the bedside. 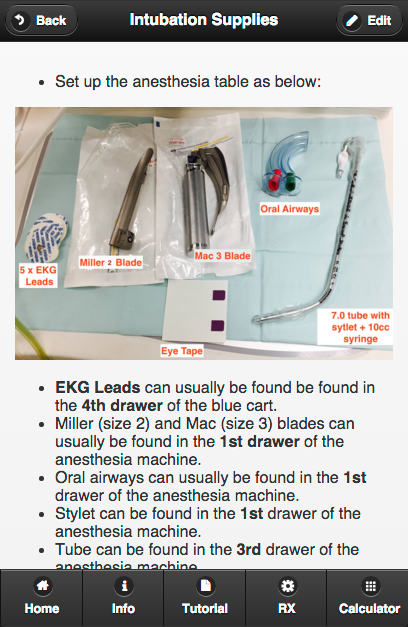 It's easy to upload pictures and diagrams into your custom clinical guides. New interns and physicians can figure out where things are simply by checking CareTeam. Want to hand-pick a set of medical calculators for use by your trainees or teaching staff? 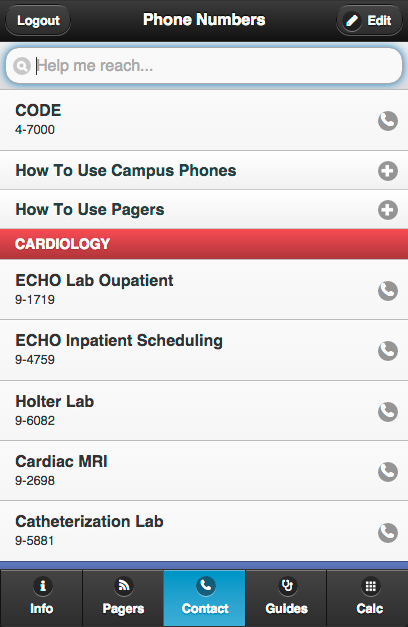 We can build calculators directly into your CareTeam App—just ask. CareTeam is currently in use by thousands of doctors, medical students, and other healthcare workers in the Mount Sinai Health System in New York, NY. Want us to build a CareTeam App for your department or program? 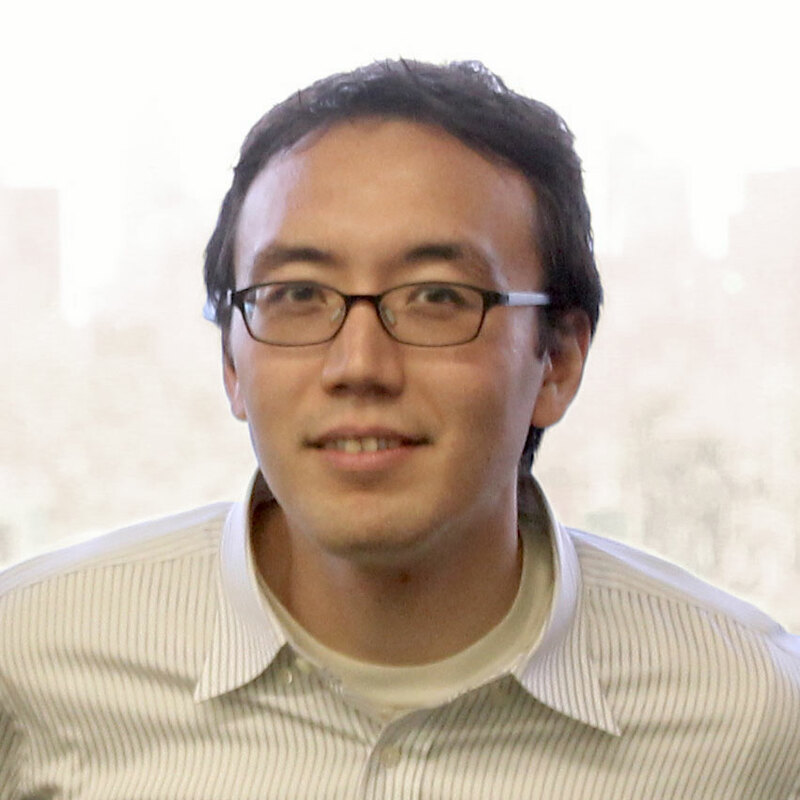 Former full stack engineer at two NYC tech startups. Graduated from Harvard College in 2011 with an AB in Biochemical Sciences. Currently a 4th year MD student at the Icahn School of Medicine at Mount Sinai. Email Ted or follow him on Twitter. Dreams in code and can debug a server with his teeth. Graduated from the University of Maryland in 2012 with a BS in Computer Engineering, Biology, and a BA in Economics. 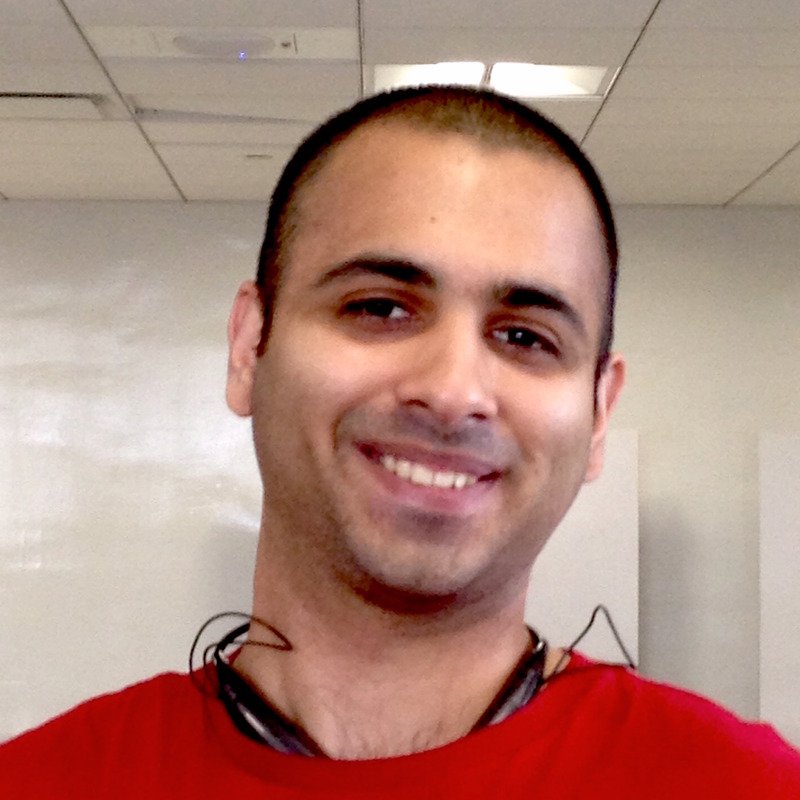 MD graduate of ISMMS and currently in a prelim year for Radiology residency at Mount Sinai. Our customer service and integration specialist. Graduated from Oberlin College in 2011 with a BA in Biochemistry. MD/MPH graduate of the ISMMS and currently a Family Medicine resident at Northwestern Medicine. Email Kevin or follow him on Twitter. Implementation guru, checklist champion, future anesthesiologist. 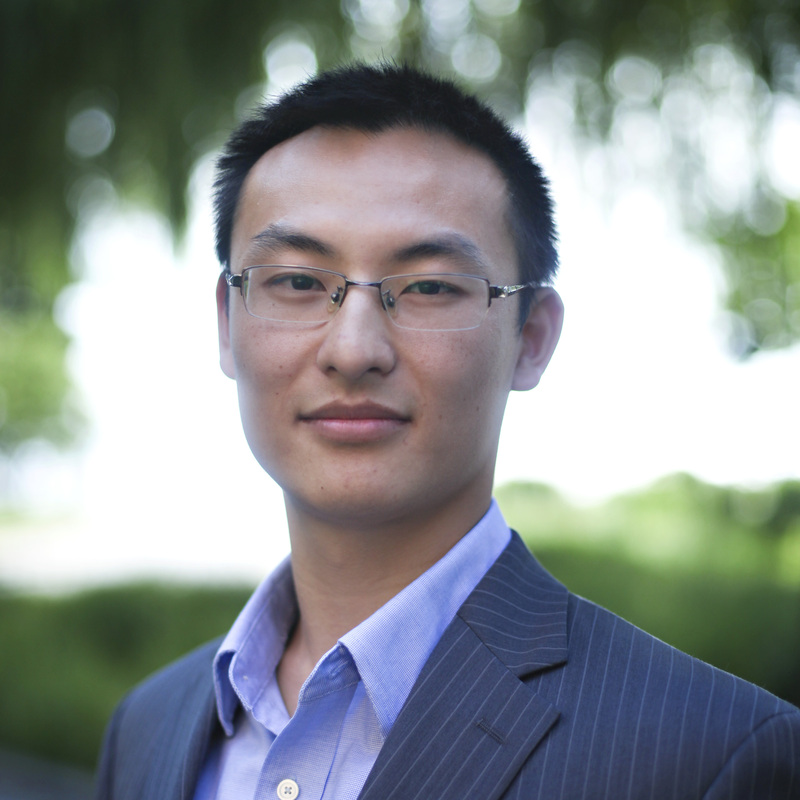 Graduated from Dartmouth College in 2011 with a BA in Biomedical Engineering. MD/MSCR graduate of ISMMS and currently an Anesthesia resident at NYP-Columbia. Email Ammar or connect on LinkedIn. Sales inquiries may also be sent to sales@eastharlemsoftware.com.